All I wanted to do was make a child’s quilt to donate to my quilt guild’s local charity – the Paulding County Sheriff’s Department. Fabric had to come from the stash. Wanted something different. My quilt top using the Children’s Delight block made from ladybug fabric (courtesy of my stash). and found the inspiration I was seeking. It’s based on the Children’s Delight block, which appeared in the 1890’s catalog of the Ladies Art Company out of St. Louis, Missouri. Needlework and domestic pursuits from previous eras is an interest of mine, so of course I had to do some further research. The fine folks over at the Antique Needlework Library, a volunteer organization dedicated to preserving needlework books and materials from the past, had actually scanned and uploaded a pdf copy of the the Ladies Art Company catalog. You can view it here. Of course, I printed out a copy – will put in protective sleeves and in a 3 ring binder to keep in my studio (along with a magnifying glass!). In case you’re interested, The Quilter’s Cache also has instructions on how to make a single block of the traditional Children’s Delight block pattern. 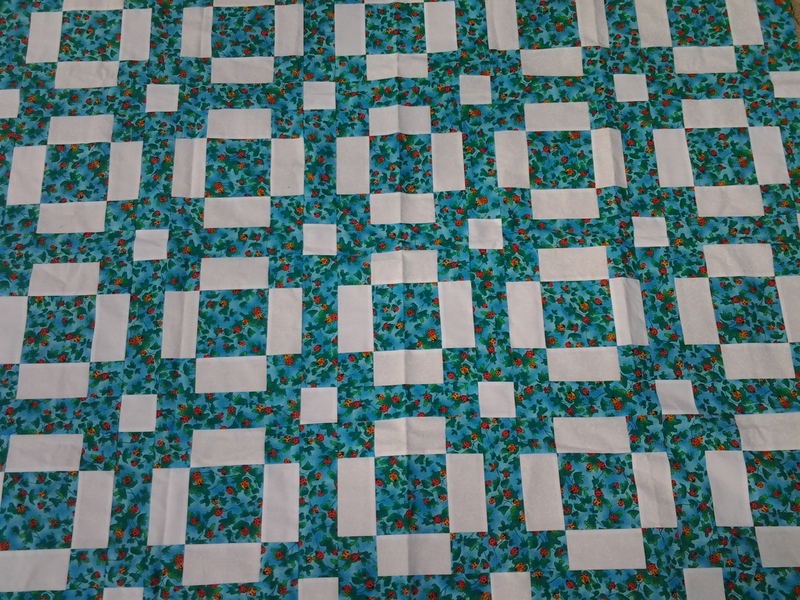 QC is also a great electronic resource for basic quilt blocks if you don’t have Electric Quilt or one of the other quilt design software programs. I’ve participated in two album block swaps that used blocks from QC. I found the directons to be accurate and easy enough to follow.